But so it goes. An interesting juxtaposition here - on the one hand death, old things that need to be swept, cut away, things that have outlived their usefulness, their time. All things come to an end, eventually. There comes a time where an ending is necessary even if it may be difficult to arrange, difficult to contemplate, difficult to experience. I do enjoy the way this card takes that on, though. We have the traditional skeleton in black robes, wielding a scythe, body parts and relics of glory on the ground beneath him...and yet he is dancing. He is dynamic, in motion, and he seems very much amused by the whole situation. It adds some perspective to the concept. And next to death, we have the three of wands. At the top, a kind of animal head seeming to want to lunge forward out of a kind of decorative vine. Flowers carved out of the top of those wands - new growth, development, beginnings. Three, which is associated with the Empress in the majors - nurturing, fertility, creativity; and wands, the suit of fire, of passion, of self-development, ambition, potential. The card of new horizons, new prospects, new possibilities out there, waiting to be grasped. Al-mustaqbal - the future, the new, waiting for you. I'm reminded by this draw of the concept behind the symbol of Ouroboros - the snake that eats its own tail. 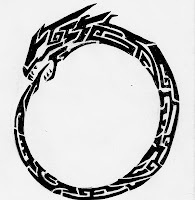 I have something similar to this specific image tattooed on my right wrist, decoration and reminder both. All ends are inherently a beginning, and all new things inherently require the end of something that came before. Tis the nature of things. A cycle, constant. Time never stands still. Existence never remains exactly the same for long. Trying to resist this is...not only limiting, but also in many cases futile. Better to roll with the changes, transformations. Give death it's due. Excitement rather than melancholy. Plans rather than nostalgia. Hmmm - thanks to you I may have to get this deck lol! Yes, plans rather than meloncholic nostalgia! Cut away the things that do not serve you any longer. Maybe even they're telling you to pack light for your vacation!! !